This short document gives a brief overview of the Trade Facilitation Agreement (TFA) and why it is important. It is available in English, French and Spanish. 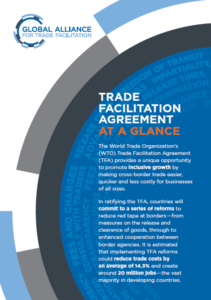 The World Trade Organization’s (WTO) Trade Facilitation Agreement (TFA) provides a unique opportunity to promote inclusive growth by making cross-border trade easier, quicker and less costly for businesses of all sizes. In ratifying the TFA, countries will commit to a series of reforms to reduce red tape at borders — from measures on the release and clearance of goods, through to enhanced cooperation between border agencies. It is estimated that implementing TFA reforms could reduce trade costs by an average of 14.5% and create around 20 million jobs — the vast majority in developing countries. WHAT IS THE TRADE FACILITATION AGREEMENT? Trade facilitation is the general term for a package of measures to help cut red tape at borders. Burdensome customs requirements present real challenges to companies of all sizes to trade internationally — particularly for smaller and medium sized companies (SMEs). Members of the World Trade Organization agreed to a landmark global agreement, known as the Trade Facilitation Agreement, or TFA. The TFA aims to speed up customs procedures; make trade easier, faster and cheaper; provide clarity, efficiency and transparency; reduce bureaucracy and corruption; and use technological advances. WHY SHOULD I CARE ABOUT A GLOBAL DEAL ON BORDER MEASURES? The TFA would have a bigger impact on international trade than the elimination of all the world’s remaining tariffs. Recent WTO studies suggest that improvements in border administration throughout the world could boost global GDP by US$1 trillion per year. The biggest benefits of the TFA would be for SMEs and developing and emerging economies, where businesses and consumers would reap the benefits of greater integration into global markets. Research by the World Economic Forum suggests TFA implementation could trigger a 60% to 80% increase in cross-border SME sales in some economies. Border procedures also affect the investment decisions of companies and play a role in attracting foreign direct investment into a country. The TFA will be binding once it enters into force and will strengthen cooperation between all stakeholders for commercially meaningful reforms. The TFA is also unique in that implementation is directly linked to the capacity of countries to fulfill their requirements, and it states that assistance should be provided to countries who need it. Member states — in consultation with their business sector — can identify the areas where they require assistance before being held accountable for successful implementation. Since 2005, around US$ 1.9 billion has been provided towards technical and financial assistance for trade facilitation and significant new funds are being mobilized. The private sector has an important role to play in identifying key challenges and opportunities and in offering expertise and support for TFA targeted reforms. Article 23 of the TFA calls for each WTO member to form or maintain a “national committee on trade facilitation” — bringing together government agencies, customs and business. These committees will play a central role in supporting effective implementation of the TFA to deliver maximum gains for governments, business and consumers.